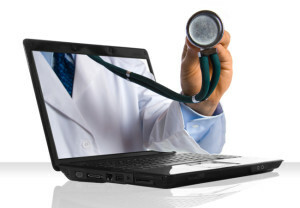 Virtual Care Tools — Why aren’t we using them? – Darren Larsen.com. Ideas. For Healthcare. Despite the obvious advantages to both patients and providers of using virtual care tools, they have had very little uptake in the average community practice. There are many reasons for this hovering in the background, from payment models to variable high speed internet access, but the most important of these has to do with office and clinical workflow. In a clinical setting, over time, every doctor and nurse has evolved a way of doing their work that is very efficient and effective for them. In fact, usually this way of dong things has evolved without much active planning. The number of patients needing to be seen is usually matched with supply of service more or less equally. 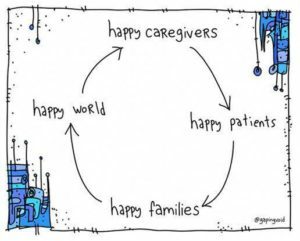 Most visits are in-person in the office setting, or for special issues like palliative care, happen in the patient’s home. In a fee for service world this makes perfect sense. As more and more primary care physicians adopt payment models involving capitation, though, one would think that workflows would have changed to match, but in actual fact they usually have not. Virtual care is almost always offered to patients, when it is offered at all, off the side of the doctor or nurse’s desk. It is supplied as an afterthought. The telephone is partially embedded in our way of doing things. This takes minimal effort. But answering an email from a patient often seems like a foreign task. Text messages are out of the question. And most practitioners will say there is absolutely no time left in the day to perform a visit by video conference or remote monitoring. So how do we change the conversation? How to we alter the paradigm?? A telephone may still be the easiest and most flexible virtual care tool we have, and it may well be under-utilized these days. Often calls are handled between patients, over lunch hours, or at the end of the day. This may seem convenient when the conversation is short and to the point, but even then there is a degree of stress involved and anything more than a simple problem quickly becomes less attractive. Likely, telephone calls can be handled more efficiently and effectively if we plan them. It seems to make perfect sense to dedicate a period of time every day for handling calls. Some analysis of supply and demand would be helpful here. More time for calls may be required on a Friday afternoon or Tuesday after a long weekend to take into account time away from the office. There will be trends and patterns that emerge. Adding in some flexibility is also helpful. If the volume is less, something will fill the time. If volume is higher then there is room to absorb the excess. Patients also benefit from knowing what approximate time period we would be most likely to call them in. That way they do not need to stay close to the telephone for a prolonged period or worry about missing a call for longer than is necessary. Virtual care visits, either by remote monitoring systems or video conferencing, may well be best treated like other appointments when incorporating them into daily office flow. They often do not last as long, as they do not involve a physician examination beyond the basics that can be offered though observation on camera, so it is quite possible to double book them into an appointment calendar. This type of visit is often less complex than one which is conducted in person, so perhaps these are best offered at the end of a morning or afternoon when the clinician’s energy reserves are lower. 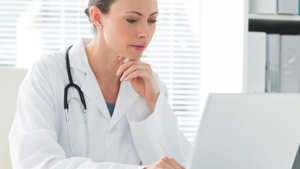 Dedicating time in a schedule for virtual video visits is very welcome by patients, as they can plan to a very narrow margin and make the most efficient use of their time or that of their caregivers. In the beginning when adopting virtual care, demand will be low. Fewer appointments will be required. However, as patients become aware of the availability of these visits, or when one is offered by staff as they book an appointment or when scheduling online, the number of appointment slots used can be gradually increased. 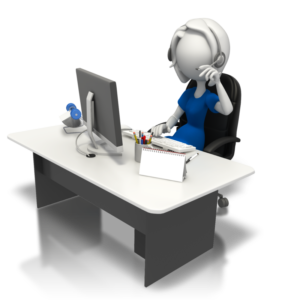 Secretarial, allied health and support staff play a huge role in the education of patients and their families about the possibilities and limitations of the virtual care visit. Not every problem is amenable to being seen remotely. Some degree of triage is usually done when patients call to see their doctor. This is a perfect time to decide if a problem can be easily handled without the patient coming to the office. If such a visit is possible it should be offered to the patient as a first choice. This avoids the virtual care encounter being seen as a lesser or secondary form of care. 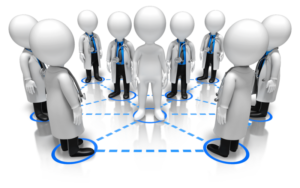 Online booking systems can also accomplish this task. With a couple of basic questions such as “would you like to have a conversation with your physician using a secure video connection rather than coming in?”, or “in your opinion will this visit require a physical examination or lab test?”, a great majority of visits can be triaged for visit type effectively. In summary, there is a change to existing workflow when adopting virtual care. In many cases, this is an an opportunity for modernization and incorporating new technology. With just a little bit of planning, careful attention to schedules and analysis of cycles of supply and demand, virtual care can become mainstream. This would make it a consistent part of the suite of services we offer our patients to look after them in the location and manner that best meets their needs. I agree with you completely Darren, and am grateful for your exploration of this. It is those things with a steep(ish) learning curve that we are more challenged to carve out the time to implement. I have found that the ability to email patients, and book phone appointments has been remarkably helpful and has increased opportunities for access to me, and improved efficiency for both me and my shared staff without compromising care – and in fact, often enhancing it! Importantly, patients have no real learning curve to implementation of either email or phone access. I have used e-consult and telederm (both feel like familiar technologies without a steep learning curve), and have attended consultations with a specialist sitting side by side with my patient. The latter has been great learning for me, and affords seamless continuity and a real sense of team that I think that the most complicated of my patients have appreciated. From a tech learning curve perspective, there is little for me to do, learn or trouble shoot and patients typically attend one of our OTN suites as they would any other appointment and there is no significant new learning in terms of process. I have been slow to adopt seeing patients by OTN myself and I think that the issues that you have identified of the challenges of set up, staff education for patients, and the steep (ish) learning curve for all of us, patients included (what’s the process for setup at the patient’s living room end of the link and who helps to do that), has been my barrier. There is much to be gained by continuing to explore this and I appreciate your blog nudge! There are many ways to offer virtual care. Looking forward to some great new ones hitting the streets soon! I echo Sarah, bring it on. 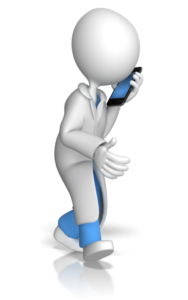 I have been doing telephone follow ups with patients for many years and even before rostered models. I would love to do email follow ups and results but lack of funding to purchase secure software that integrates with the EMR is a big barrier. OTN is available only in FHT’s and Hospitals so access for rural patients who have long travel to even an OTN site is problematic. When we book the patients at the local hospital for a specialist, they often don’t show as they see it as “not a real appointment”. Office based OTN has been promised but has not been offered in our area. Finally, at least 50% of our patients do not have Internet except perhaps on a smartphone and about 20% have no reliable phone of any kind. Some patients change cell phones more quickly than clothes, I think. These are usually my most complex patients who I would love to check in with more regularly but can’t track them down except by calling the second cousin or some such. My staff and I spend hours tracking people down with important information so spending more chasing patients electronically would not make us more effective. Love to compare notes on urban vs patient communication preferences and how to improve in any way possible. Sorry I missed this reply! Thanks for all the detailed insight into how difficult it is to implement virtual care tools, even when you really want to. Hopefully more are coming on line soon to assist with this! And mobile phones are actually likely to be the most useful way!